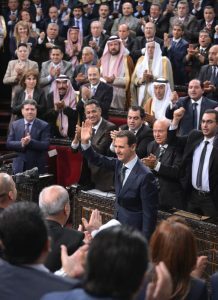 Damascus, SANA – President Bashar al-Assad said that the Syrian people surprised the world with their unprecedented participation in the People’s Assembly elections, sending a clear message to the world that the greater the pressure gets, the more the Syrians commit to their sovereignty. In a speech addressing the People’s Assembly of the 2nd legislative term on Tuesday, the President started with congratulating the Syrian people on the advent of the holy month of Ramadan, hoping that in next Ramadan Syria will have recovered. His Excellency said that while this is not the first time he stands at the Assembly after a new parliament was elected, but this time is greatly different from the previous ones as these elections came amid great international and regional and political events and amid harsh internal circumstances that led some to expect the elections to fail or not be accomplished, or if accomplished, they would be boycotted completely by the citizens, or at best they would be met with indifference. 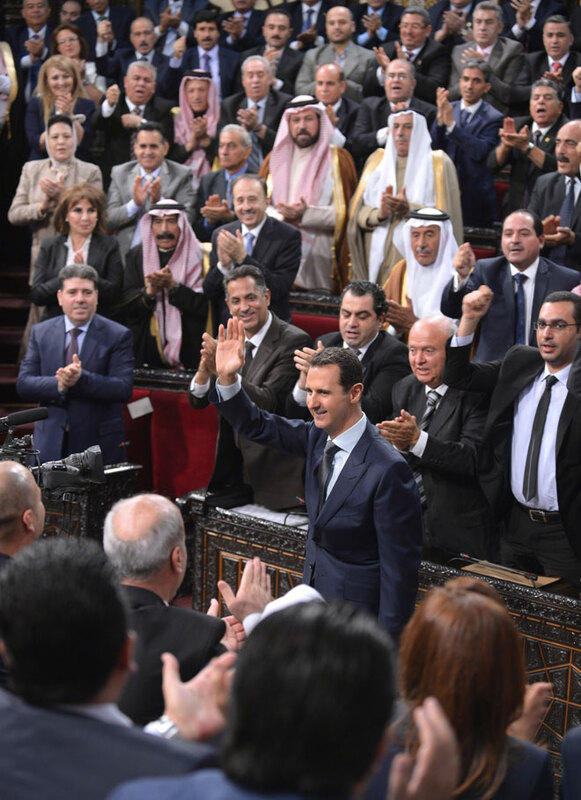 “But what happened was the opposite, as the Syrian people surprised the world once again with their wide participation in one of the important national and constitutional events,” President al-Assad said, adding “the unprecedented level of participation by voters to elect their representatives at the People’s Assembly was a clear message to the world that the greater the pressure gets, the stronger the Syrian people’s commitment to their independence becomes, and that the further others attempt to interfere in their affairs, the more they prove to be committed to the constitution as the defender of independence and the pillar of stability. “This national stance was not represented by the level of participation only, but also by the unprecedented number of candidates, who also showed a high sense of patriotism and awareness. President al-Assad noted that just as these elections were not ordinary and the level of participation was unprecedented, this Assembly also came different from the previous ones, as the voters who are used to electing representatives showed much responsibility and awareness and a high level of understanding of the changes in the situation and the value of sacrifices. His Excellency noted that this time, the number of women, youths, and holders of higher university degrees is much greater than before. President al-Assad said that the world is currently witnessing unusual conditions with the West seeking to preserve its grip on the world at any cost, resulting in international clashes that in turn created regional clashes between states that seek to preserve their sovereignty and independence and states that do others’ bidding, and this reflected on the region in general and on Syria in particular. The President said “It is no longer secret that the essence of the political process for the regional and international countries supporting terrorism has been, since the beginning and throughout the various initiatives, aimed at undermining the presence of any concept of the homeland through hitting its core, which is the constitution, and through continuous pressure to consider it null and stop it and freeze it under different names and terms, mainly the so-called transitional stage. “And of course, through hitting the constitution, two main pillars of any state get hit: the first is the institutions, on top being the institution of the army that is the defender of the state and the guarantor of the people’s security, as they started focusing on that greatly since the start and during any talk about Syria’s future and institutions. The other pillar is the diverse national, pan-Arab and religious identity of Syria, which they started to focus on when they realized that it was the underpinning of the homeland’s steadfastness at the beginning of the events. The President stressed that the sectarian experiences prove that sectarian regimes turn the people of one homeland into adversaries, and when there are enemies and adversaries anywhere, then in that case each party looks for allies, and the allies in such cases wouldn’t be inside Syria, or inside the homeland, and since relationships would be based on doubt, grudge, and hatred in the sectarian model, then the ally would be found in the outside. “Here is when the imperialist states come and put themselves forward as protectors of those groups, and their interference in the affairs of that homeland becomes justified and legitimate, and then they move at some point to partitioning when the partitioning scheme is ready. Therefore, and in order to consolidate their scheme, we all notice that the sectarian terms occupy a significant space in the political discourse of the terrorism-sponsoring countries, the regional and the international ones,” he added, stressing that all this seeks to consecrate this concept and make it seem unquestionable or even indispensable, at which point pressure would begin on Syria to accept this logic. 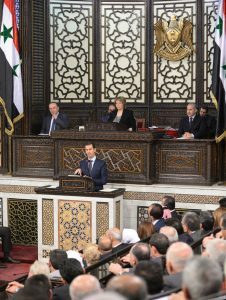 President al-Assad said that after reaching agreement over the principles proposed by Syria, then it’s possible to discuss other issues like the national unity government which would draft a new constitution via a specialized committee then put it to referendum, with parliamentary elections coming after that. He said that everyone today asks repeatedly “what is your vision for the solution,” explaining that the solution has two aspects: the political side and fighting terrorism. Returning to the issue of principles, the President said principles are necessary in negotiations or talks because they need reference points, and in the case of Syria they try to say that the reference point is decision 2254, but decisions contradict themselves, like the 2012 Geneva statement that speaks of Syria’s sovereignty and at the same time tries to impose a transitional body on the Syrian people. He said that when one sets principles, they prevent sides from proposing whatever they want and define limits, and any proposition outside these principles would be considered obstruction and lack of seriousness. “I will quickly mention the basic principles proposed in the paper: Syria’s sovereignty and unity, rejection of foreign interference, rejection of terrorism, supporting reconciliations, preserving establishments, lifting the siege, reconstruction, and controlling borders. There are also other points that are mentioned in the current constitution and other constitutions like cultural diversity, citizens’ liberties, and independence of the judiciary, and other principles. We didn’t agree to any proposition outside these principles, quite simply, and this is why they refused. We didn’t hear anyone saying no but there was evasion,” President al-Assad said. 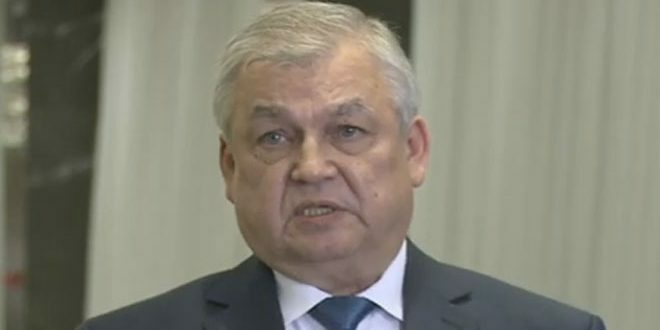 His Excellency said that the principles paper was ignored by the other sides, and instead there was a suggestion from international sides to engage in indirect talks in different rooms with the facilitator playing the mediator, which also didn’t happen, adding that what was proposed was merely a number of questions under the tagline of “common denominators” when in fact all these questions were traps that contained terms that would harm Syria’s sovereignty, safety, its establishments, or its society. He went on to reiterate that the “other side” came to Geneva against their will after their masters forced them to go, and they came yelling and went and sulked in their hotels, and once in a while their masters would instruct them to make a certain statement, and apart from all of that there were no negotiations or agenda, as the only agenda approved for them by Riyadh is the agenda of when to wake up, sleep, and eat. “Of course, when they failed to achieve what they wanted in the first time, they wanted to withdraw and hold Syria responsible, but they couldn’t do that in the second time. 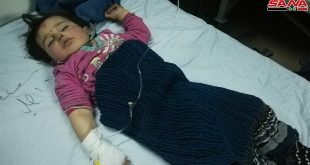 In the last time, their response was a public declaration of supporting terrorism and stopping the truce or withdrawing from the truce or what was called the cessation of hostilities,” stressing that the aftermath of that was the brutal shelling of Aleppo and the targeting of hospitals, civilians, and children by terrorists. “Although most Syrian provinces, villages, and towns have suffered and still suffer from terrorism, and they resisted it and still do, Erdogan’s fascist regime has always focused on Aleppo because for him it’s the only hope for its Muslim Brotherhood project after he failed in Syria and after his criminal and extremist nature was exposed to the world, and also because Aleppo’s people refused to be a pawn and a tool in the hand of strangers and they resisted and persevered and remained in Aleppo, defending it and defending the homeland,” adding that Aleppo will be the graveyard where the dreams and hopes of the butcher Erodgan will be buried. The President went on to note that in addition to what happened in Aleppo, terrorism continued to strike, with massacres in al-Zara and barbaric bombings in Tartous and Jableh, with terrorists trying in vain to incite strife in Syria, because all Syrians are brothers in life and in martyrdom who cling to life, steadfastness, and victory. 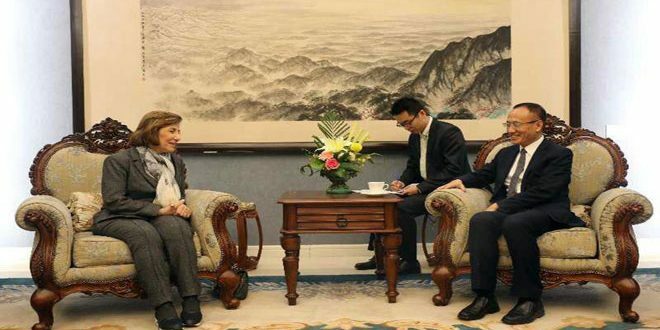 “In this context, the issue that was proposed constantly during the past few months was the issue of truce. Many of us hold the truce responsible for all that is happening. Let’s talk objectively here; nothing in this world is absolute except divine ability, and for us humans everything is relative. The truce, like anything else, if is positive then it has negative points, and if it’s negative it has positive points. 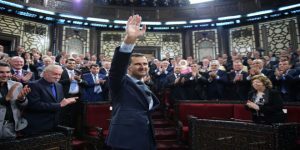 In all cases, this truce doesn’t cover all areas in Syria in order for us to burden it with the negativities,” he said, adding that the truce resulted in many reconciliations that prevented a lot of bloodshed of Syrian civilians and armed forces, in addition to having benefits on the international levels that won’t be discussed now. “On the military level, it allowed for concentrating military efforts in specific directions and realize achievements, and the first proof is liberating Palmyra shortly after the beginning of this truce and after it al-Qaryatain, and in the Ghouta of Damascus several areas were liberated of course,” the President said, adding that some of those areas were liberated in these months in much less than it would have taken to liberate them otherwise. He explained that the problem with the truce is that it was reached with international consensus and with the agreement of the State, but there was no commitment by the US side in particular to the terms of this truce, and the US turned a blind eye to the actions of its Saudi and Turkish agents in the region. President al-Assad noted that the Saudis openly declared their support for terrorism more than once, and Turkey openly sends terrorists across the borders to the northern areas in Syria, all while the Americans turn a blind eye to these practices, stressing that Erdogan, who caused chaos by sending forces into Iraq, blackmailed the Europeans with the refugees issue, and sent thousands of terrorists to Aleppo recently, has been reduced to a political bully or hoodlum. “They weren’t content with the terrorism of explosives and shells; they also backed it with economic terrorism through sanctions against Syria and through pressuring the Syrian Pound with the goal of economic collapse and bringing the people to their knees,” the President said, noting that despite all difficulties the Syrian economy is still withstanding, with recent monetary steps proving the possibility of standing up to pressure and reducing the damage its caused and stabilizing the Syrian Pound. His Excellency said that this will probably be a priority for the Assembly and for the new government that will be formed as per the constitution, explaining that the issue of the Syrian Pound is linked to the effect of terrorism in terms of its attacks on infrastructure and economic facilities, cutting off roads between cities, scaring off capitals, and the people’s reaction in general to terrorism. 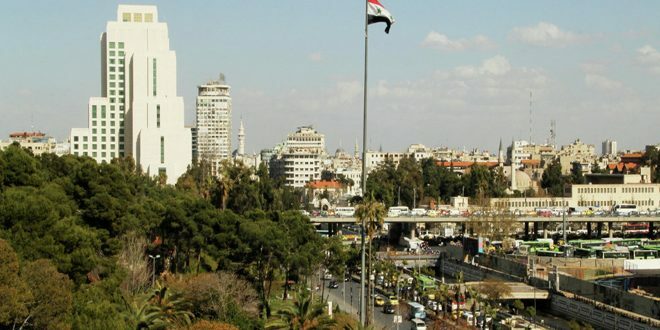 President al-Assad pointed out that addressing with the Syrian Pound is a short-term issue, while the long-term issue is economy which was affected by the crisis in various ways, with some investors suspending their projects at the beginning in hopes of things returning to normal, while others continued with their work. He stressed that what is needed for the sustainability of support the Syrian Pound and the economy is for investors to carry out projects regardless of their scales and for the government to look into laws and legislations to strengthen the economy, noting that after five years of the crisis, Syrians now have experience in how to deal with the current situation and don’t have to start from the beginning. “The terrorism of economy and the terrorism of explosives and massacres and shells are one and the same, so I assure you that our war against terrorism continues, not because we like wars, because they imposed war on us, but the bloodshed won’t end until terrorism is uprooted no matter where it is and regardless of the masks it wears. 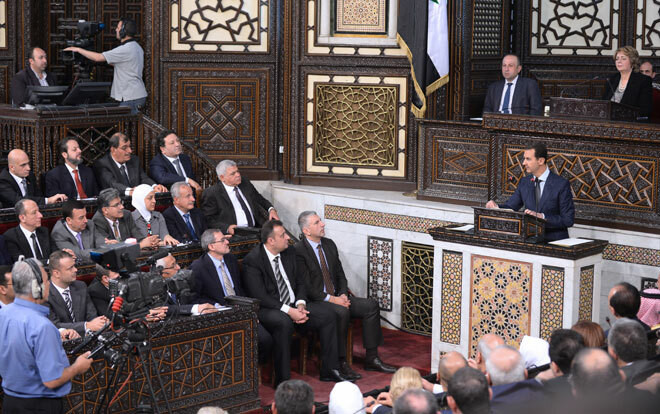 His Excellency reiterated his call for everyone who decided to bear arms for any reason to join reconciliations, because the path of terrorism only leads to destroying Syria and the loss of its people without exception. 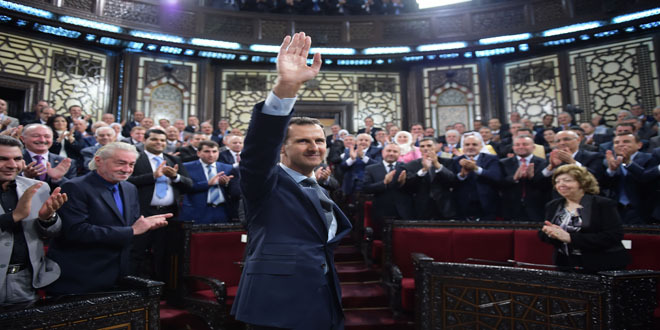 The President addressed the Army and Armed Forces and the supporting forces, saying that no words can do them justice as they are the reasons why Syria persists, saluting them and their families and their comrades who were martyred or injured. 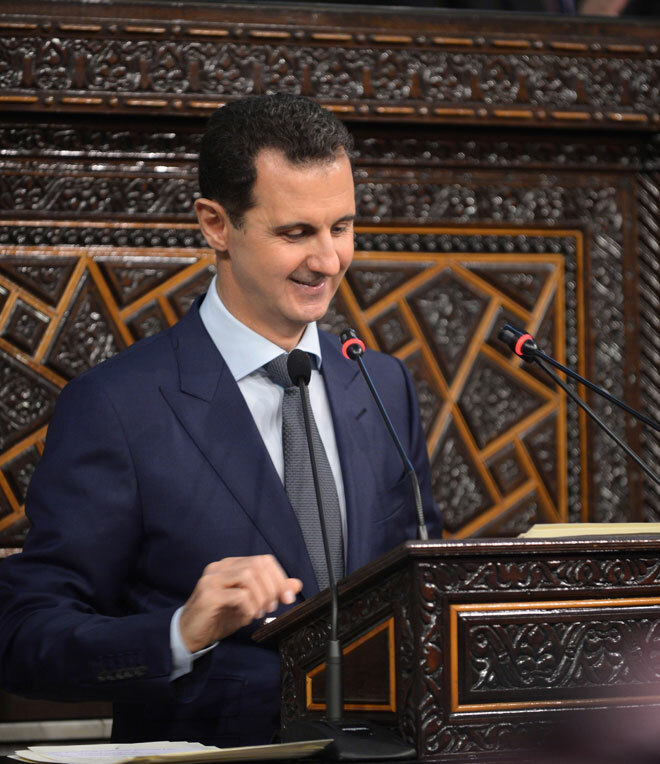 “The defeat of terrorism must be realized as long as there are states like Iran, Russia, and China that support the Syrian people and stand by righteousness and assist the wronged in the face of the wrongdoer,” President al-Assad said, thanking these states for their firm positions and for respecting their principles and supporting peoples’ right to self-determination. “Here I hope that we don’t pay any heed to what is proposed in media about disputes and clashes and divisions. Things are much more firm than before and the vision is much clearer. Don’t worry; things are good in this track,” he added. The President also thanked the Lebanese resistance for the help it provided in fighting terrorism in Syria and saluted its fallen heroes. Addressing the Assembly members, His Excellency said that they are faced with serious tasks and major challenges, and while the sacrifices of Syrian heroes who gave their lives for their country is part the price of restoring security, triumphing over terrorism, reclaiming land, and rebuilding Syria, then the other part of that price is fighting corruption, chaos, and unlawful actions.